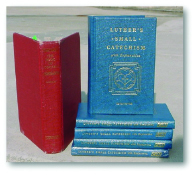 LHF answe red Andrew’s call by sending him five copies of Luther’s Small Catechism and a Book of Concord. Excited by what he read, Andrew shared the books with his Christian friends and the rest, as they say, is history. Since 1994, LHF has been providing support to the Lutheran church that grew from these early efforts. The Evangelical Lutheran Church in South Sudan/Sudan (ELCSS/S) numbers over 150,000 members. This assistance has come in the form of translation and publishing (Luther’s Small Catechism, hymnals and the like) as well as coordinating and guiding their seminary program at the Concordia Lutheran Institute for the Holy Ministry (CLIHM). In response to a desperate need for pastors to serve their fast-growing church body, the ELCSS/S in 2000 formed the Concordia Lutheran Institute for the Holy Ministry, or CLIHM. The seminary is a four-year residential program (three years of academic study, followed by a year of vicarage) centered in Yambio, South Sudan. There is an immense need for volunteer instructors (ordained LCMS pastors) at CLIHM, teaching such subjects as Old and New Testament, Homiletics and Liturgy. Remedial English teachers are also needed. To learn more about this volunteer opportunity, click here. “It is evident that even before LHF’s formation, the Almighty God had determined yet another plan: creating and organizing a Lutheran Church body in Sudan known today as the ELCSS/S,” says Bishop Peter Anibati Abia. “It is true as it is said, ‘We plan, but God determines the way.’” Click here to learn more. Click below to read stories about the church in Sudan and South Sudan.